Please note: If your vial is a “blow back” type please indicate that when placing your order. The vent ports on top of the thermocouple holders simulate the vapor path of a standard split stopper in area. Gravimetric studies were done with this configuration to further confirm that the thermocouple vent port allowed the passage of vapor in the same manner in a split stopper. This allows the monitored sample to be run along side the standard samples without interference. 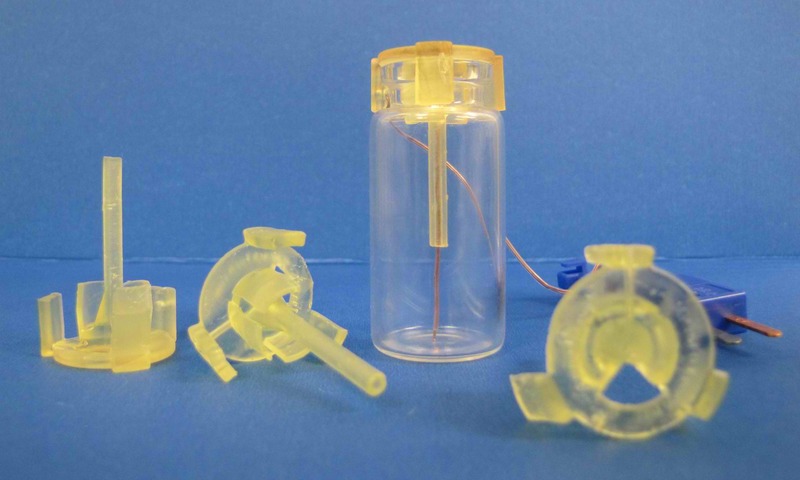 Thermocouple Holders for Freeze Drying provide an easy and accurate way of placing a product sensor in a vial. They can be locked into place and provide a consistent placement and can be used repeatedly. Each probe is designed to be adjustable for various vial heights. 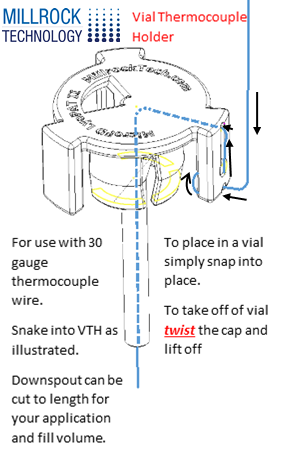 VTH-M-0013 Vial Thermocouple Holder for 13 mm neck. VTH-M-0020 Vial Thermocouple Holder for 2o mm neck.